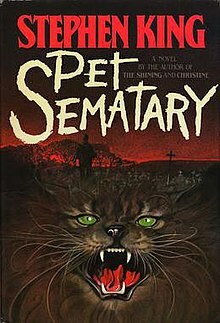 Pet Sematary is a 1983 horror novel by American writer Stephen King, nominated for a World Fantasy Award for Best Novel in 1986, and adapted into a 1989 film of the same name. In November 2013, PS Publishing released Pet Sematary in a limited 30th Anniversary Edition. Louis Creed, a doctor from Chicago, is appointed director of the University of Maine's campus health service. He moves to a large house near the small town of Ludlow with his wife Rachel, their two young children, Ellie and Gage, and Ellie's cat, Church. From the moment they arrive, the family runs into trouble: Ellie hurts her knee after falling off a swing, and Gage is stung by a bee. Their new neighbor, an elderly man named Jud Crandall, comes to help. He warns Louis and Rachel about the highway that runs past their house; it is constantly used by speeding trucks. This article is about the novel. For other uses, see Pet Sematary (disambiguation). Pet Sematary is a 1983 horror novel by American writer Stephen King, nominated for a World Fantasy Award for Best Novel in 1986, and adapted into a 1989 film of the same name. In November 2013, PS Publishing released Pet Sematary in a limited 30th Anniversary Edition. Louis Creed, a doctor from Chicago, is appointed director of the University of Maine's campus health service. He moves to a large house near the small town of Ludlow with his wife Rachel, their two young children, Ellie and Gage, and Ellie's cat, Church. From the moment they arrive, the family runs into trouble: Ellie hurts her knee after falling off a swing, and Gage is stung by a bee. Their new neighbor, an elderly man named Jud Crandall, comes to help. He warns Louis and Rachel about the highway that runs past their house; it is constantly used by speeding trucks. Louis himself has a traumatic experience during the first week of classes. Victor Pascow, a student who has been fatally injured in an automobile accident, addresses his dying words to Louis personally, even though the two men are strangers. On the night following Pascow's death, Louis experiences what he believes is a very vivid dream in which he meets Pascow, who leads him to the deadfall at the back of the "sematary" and warns Louis to not "go beyond, no matter how much you feel you need to." Louis wakes up in bed the next morning convinced it was, in fact, a dream—until he finds his feet and bedsheets covered with dried mud and pine needles. Nevertheless, Louis dismisses the dream as the product of the stress he experienced during Pascow's death, coupled with his wife's lingering anxieties about the subject of death. Louis is forced to confront the subject of death at Halloween, when Jud's wife, Norma, suffers a near-fatal heart attack. Thanks to Louis's prompt attention, Norma makes a quick recovery. Jud is grateful for Louis's help and decides to repay him after Church is run over outside his home at Thanksgiving. Rachel and the kids are visiting Rachel's parents in Chicago, but Louis frets over breaking the bad news to Ellie. Sympathizing with Louis, Jud takes him to the pet sematary, supposedly to bury Church. But instead of stopping there, Jud leads Louis farther on a frightening journey to "the real cemetery": an ancient burial ground that was once used by the Micmac Indians. There Louis buries the cat on Jud's instruction. Louis thinks that the subject is finished – until the next afternoon when Church returns home. It is, however, obvious that the cat is not the same as before. While he used to be vibrant and lively, he now acts ornery and "a little dead", in Louis' words. Church hunts for mice and birds much more often, but he rips them apart without eating them. The cat also smells so bad that Ellie no longer wants him in her room at night. Jud confirms that this condition is the rule, rather than the exception, for animals who have been resurrected in this fashion. Louis is deeply disturbed by Church's resurrection and begins to wish that he had never done it. Two-year-old Gage is run over by a speeding truck in a horrible accident several months later. Overcome with despair, Louis considers bringing his son back to life with the help of the burial ground. Jud, guessing what Louis is planning, attempts to dissuade him by telling him the gruesome story of the last person who was resurrected by the burial ground, Timmy Baterman. Baterman died while coming home from World War II. His father Bill buried Timmy in that cemetery. Timmy came back as a malevolent zombie, terrorizing the townsfolk, before the men of the town realized that they must kill him again for good. Jud, along with three of his friends, later went to the Baterman home to kill Timmy, only for him to taunt the men with indiscretions from their personal lives that Timmy had no way of knowing. Jud and the men quickly fled in horror while the mentally unstable Bill killed Timmy and burned their home down, killing himself. Jud states that he believes that whatever came back was not Timmy, but a "daemon" that had possessed his corpse. He then concludes that "Sometimes, dead is better" and states that "the place has a power... its own evil purpose," and may have caused Gage's death because Jud introduced Louis to it. Despite Jud's warning and his own reservations about the idea, Louis's grief and guilt spur him to carry out his plan. Louis exhumes Gage's body from his grave and inters him in the burial ground. Gage returns from the dead as a monstrous, demonic shadow of his former self and kills both Jud and Rachel. After killing Church, Louis confronts his son and sends him back to the grave with a lethal injection of chemicals from his medical supply stock. After burning the Crandall house down, he returns to the burial ground with his wife's corpse, thinking that if he buries the body faster than he did Gage's there will be a different result. The book ends with Louis sitting with his back to the door playing solitaire, listening to Rachel's reanimated corpse walk up behind him to drop a cold hand on his shoulder while her voice rasps, "Darling." In 1978, King returned to his alma mater, the University of Maine at Orono, to teach for a year as a gesture of gratitude for the education he had received there. During this time his family rented a house on a busy road in Orrington. The road claimed the lives of a number of pets, and the neighborhood children had created a pet cemetery in a field near the Kings' home. King's daughter Naomi buried her cat "Smucky" there after it was hit, and shortly thereafter their son Owen had a close call running toward the road. King wrote the novel based on their experiences, but feeling he had gone too far with the subject matter of the book, he discarded the idea of having it published, particularly since both his wife Tabitha and friend Peter Straub agreed that Pet Sematary was too dark and unenjoyable. However, needing a final book for his contract, King reluctantly submitted it to Doubleday on the advice of his wife. The subsequent success of the book led King to note how both Americans and British readers liked it even though "it just spirals down into darkness. It seems to be saying that nothing works and nothing is worth it, and I don’t really believe that." King has gone on record stating that of all the novels he has written, Pet Sematary is the one which genuinely scared him the most. Pet Sematary was made into a film in the autumn of 1988 and released in April 1989. It is directed by Mary Lambert, starring Dale Midkiff as Louis, Fred Gwynne as Jud, Denise Crosby as Rachel and Miko Hughes as Gage. A man, Andrew Hubatsek, was chosen for Zelda's role because the filmmakers could not find a woman bony enough to portray the terminally ill girl. Pet Sematary Two was released in 1992. A readaptation of the novel is set for release on April 5, 2019. Directed by Dennis Widmyer and Kevin Kolsch, the film stars Jason Clarke as Louis Creed, Amy Seimetz as Rachel Creed, John Lithgow as Jud Crandall, Jeté Laurence as Ellie Creed, and twins Hugo and Lucas Lavoie as Gage Creed. In 1997 BBC Radio 4 broadcast a dramatization of the story in six half-hour episodes, later re-edited into three hour-long episodes. It was adapted by Gregory Evans and starred John Sharian as Louis Creed, Briony Glassco as Rachel Creed and Lee Montague as Jud Crandall. The production was directed by Gordon House. In 1989, The Ramone’s song “Pet Sematary” was written for the Steven King movie. Steven King was a known Ramones fan. It played during final movie credits and was released on their “Brain Drain” album. The Ramones video for the song featured the band with video clips from the 1989 movie including a cameo of Steven King and featured cameos from Blonde band members. In 2002, New York horrorcore rapper Cage wrote the song "Ballad of Worms" which was featured on the album "Eastern Conference All Stars III" for the independent hip-hop label Eastern Conference Records. Once thought to be about his relationship and struggle with the hip-hop community, he later revealed it was a love song dedicated to the Pet Sematary character Zelda. ↑ "1984 Award Winners & Nominees". Worlds Without End. Retrieved July 22, 2009. ↑ "UK genre publisher of SF, Horror & Fantasy fiction". www.pspublishing.co.uk. ↑ King, Stephen (2010-03-22). "Pet Sematary". ISBN 978-1-84894-085-7. ↑ Rojak, Lisa. Haunted Heart: The Life and Times of Stephen King. pp. 85, 115. ISBN 1-4299-8797-9. ↑ "Pet Sematary (1989)" – via www.imdb.com. ↑ Jr, Mike Fleming (2017-10-31). "Stephen King 'Pet Sematary' Remake Lands 'Starry Eyes' Duo Dennis Widmyer & Kevin Kolsch". Deadline. Retrieved 2017-11-14. ↑ "Pet Sematary", radiolistings.co.uk. Retrieved February 8, 2012. ↑ "The High & Mighty – Presents Eastern Conference All Stars III". www.discogs.com. Retrieved 13 January 2018. ↑ "Cage - Ballad of Worms Lyric Genius". genius.com. 1 January 2012.